Are you looking for home removals Epsom? Funnells Removals are home removals Epsom specialists with many years experience in the careful relocation of peoples personal belongings with our fully trained, uniformed and experienced staff. We are experienced and fully trained to move pianos of all types, grandfather clocks, barometers and antique furniture. Whatever you need moving we can handle it, so call us now for a free home removals Epsom quotation. Come to Funnell’s Removals and take the worry out of the big day. 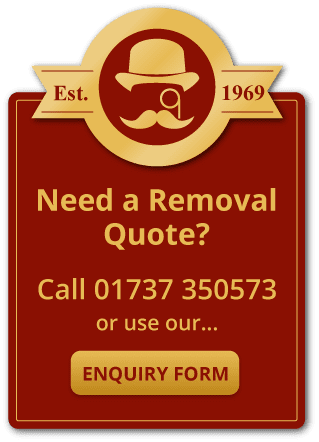 We are a family run home removals Epsom company with over 45 years of experience and have developed a clear philosophy about customer care and service. We combine our professionalism with a friendly, easy approach which is rarely found anywhere today. Free estimates and professional advice. Home removals Epsom and throughout Britain and Europe. Part loads or single items anywhere in the world. Full/Part packing service or supply of boxes and materials in advance for owner packing. Modern containerised or conventional storage. High level comprehensive insurance cover. The National Guild of Removers & Storers. Epsom is a very well known Town situated in Surrey mainly due to it being the home of the Epsom Derby which is held every year in June and attracts many thousand of visitors. In its early days the British Prime Minister and first chairman of the London County Council, Lord Rosebery was actually expelled from the University of Oxford in 1869 for buying a racehorse and entering it in the Derby! Lord Rosebery was closely associated with Epsom and Rosebery Park and Rosebery school are named after him. Epsom was known historically as a spa town although little evidence is left today apart from a water pump, but during the mid 17th century the wells of Epsom were well known and attracted visitors to the area including Samuel Pepys and a well known Dutch artist Willem Schellinks who created a number of drawings of the area and its wells. Also Epsom Salts gets its name from the town due to the salts being extracted from the mineral water at Epsom. Many well known people were born or have made Epsom their home such as Jeremy Vine, Michaela Strachan, Norman Wisdom, Jimmy White and Jimmy Page of Led Zeppelin whose father owned the Page Motor garage in Epsom. Epsom is a well built up town, but surrounded by beautiful country side. The Town centre has two large shopping centres and there are many schools and colleges as well as a large general hospital and a leisure centre. There is also the Horton farm which attracts many families. Epsom is close to London with great travel links to and from the city making Epsom an ideal location for commuters. The area is well built up with a mix of dwellings from very large homes to smaller apartments with many new developments going up over the years. Funnells Removals has a varied fleet of different sized vehicles to cater for any relocation requirements for home removals in Epsom whether you have a large family home or an apartment. We have the resources to ensure a smooth and efficient move.